Ripple is the twenty million year old story of how love inspired one dolphin to an intellectual achievement which changed the universe. There are dozens of independent unsolicited reviews at Ripple's Amazon USA page, available via the yellow Amazon button below. Ripple is fiction in the Visionary and Metaphysical genre. It is a love story with elements of horror, sci-fi and environmental fantasy. The novel has attracted reviews from all over the world and is often favourably compared to Jonathan Livingston Seagull and Life of Pi. Originally self-published in English, Ripple is now also traditionally published in translation in The Czech Republic and Slovakia. The Czech edition is called "Vlnka". Ripple was first published in 2011 and soon after was selected by the New Zealand Society of Authors to represent it at the Frankfurt Book fair in 2012, the year that NZ was "Country of Honour" there. Reviews continued to arrive until Ripple became one of the best-reviewed NZ novels on Amazon, reaching top spots on several Goodreads lists. She spent many months as top book on the Visionary and Metaphysical Fiction list on Goodreads and is still in their top three all these years later. 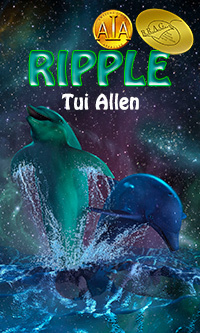 Read an interview with Ripple author Tui Allen on the Visionary and Metaphysical Fiction web site. 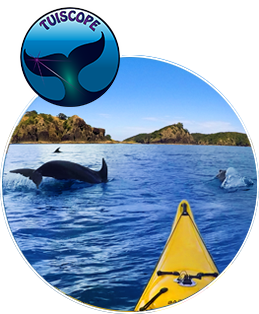 A second dolphin novel, Thalassa, is at third draft stage. Thalassa has links to Ripple despite being set twenty million years later. Unlike Ripple, the story has several important human characters. Tui is having problems staying ashore long enough to work on Thalassa because she spends so many hours paddling around the nearby islands in her kayak. However the universe may intend this for her, as she sometimes meets her own characters face to face out there on the water. These experiences enrich her understanding of them and their setting. She records some of them in videos and photos which she often displays on her youtube or facebook pages. After spending so many years living inland, her return to the marine world she inhabited before, absorbs and enthralls her. Her new home in the Bay of Islands of New Zealand has a marine environment which may be as pristine as it is possible to find in today's polluted oceans.